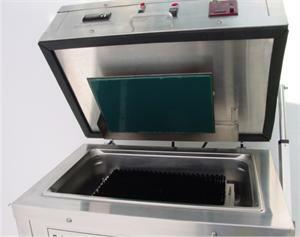 Select Rubber Scrubber 120 volt, 60 Hz. 240 volt, 50 Hz. 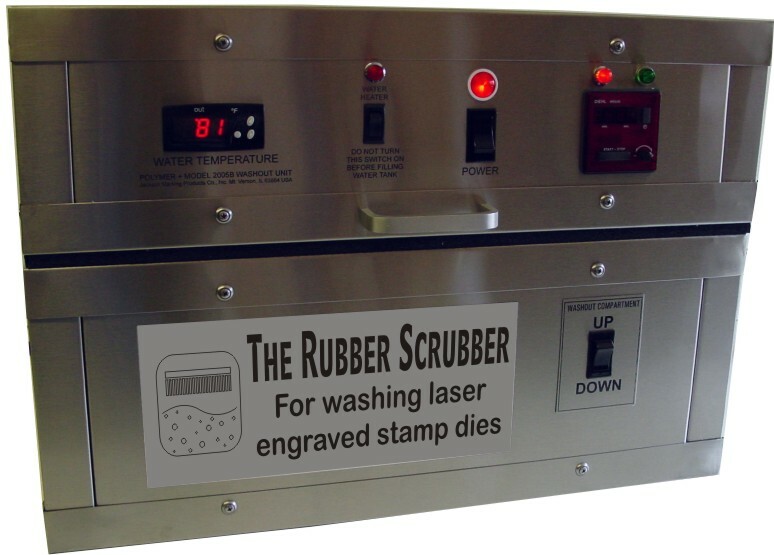 Count on this machine to thoroughly and completely wash ash and other residue from your laser engraved rubber or polymer die material! You’ve made the investment to automate stamp production by laser engraving. 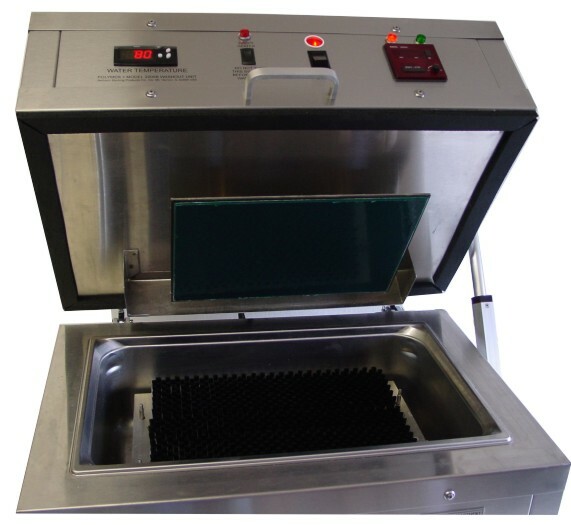 Now you can further streamline your operation by eliminating the time and strain of someone bending over a wash basin to scrub dies by hand with a brush. Your engraved die attaches to a flat plate at the top of the machine. The plate orbits alternately between clockwise and counterclockwise movement, rubbing the die across a soft brush pad that is anchored at the bottom, in the washout tank. The height of the 9½” x 14” nylon brush pad is easily adjusted. The tank is filled with water and detergent. A shut off valve with hose fitting is connected to the bottom of the tank and protrudes from the back of the machine for efficient filling and draining of washout solution. 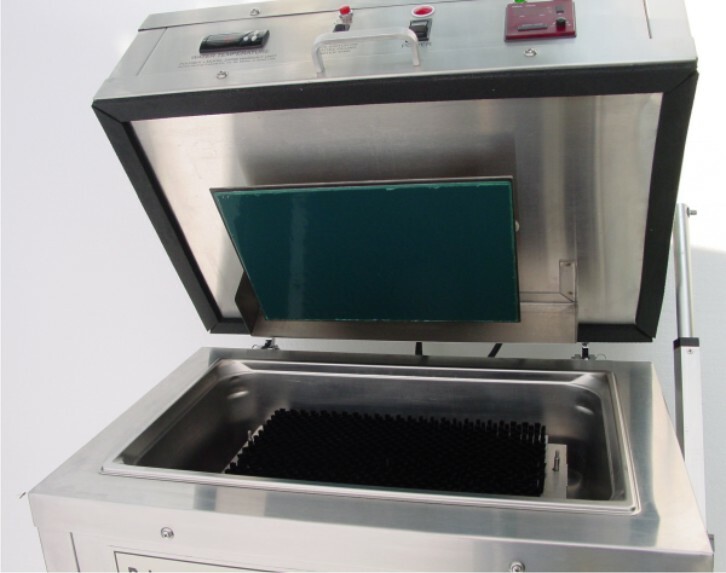 850 watts of heating power are built into the tank to quickly bring the washout solution up to operating temperature. The lid is opened with a power vertical actuator so opening and closing the unit is accomplished with the flick of a switch. No heavy lifting required! Washout plate area: 9" x 13"
Dimensions: ~24-3/4" x 16-1/2" x 17-1/4"